Above: The unambiguously straight duo. 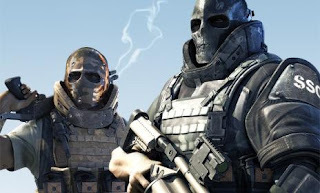 My review of Army of Two: The 40th Day is up now at thephoenix.com. I liked the first one well enough, but mostly I thought if the sequel could fix what I didn't like, then it could be something approaching great. Instead, The 40th Day eliminates what worked before, retains what didn't, bungles the play control, and ultimately doesn't work on any level. Too bad. I wrote this review two weeks ago, and at the time had some more to say about it, but then I broke my elbow and had surgery and have endured a pretty rotten time of it, so now I can't remember what any of that was. Fortunately, I'm in the recovery phase now, and starting to feel okay. My arm is in a huge splint, but I can both type and play video games, so I'm hoping that next week I'll be able to start the machine back up. I'm not even sure what I should play. Probably No More Heroes 2. Sounds like you'll be playing NMH2 with the classic controller. Report back on how that works, please. I'd try it myself, but I don't want to miss out on any wii-mote specific tricks, like how I missed out on the cell phone calls in the first game because I had my wii-mote speakers muted. Sorry to hear it. Get well soon. My workday hasn't been the same without you! Broken bones are no fun indeed. Get better soon! Sorry to hear about your broken elbow. I already missed your weekly comments on gaming. But now your back... hurray! I would be interested if you have a bit of spare time (before you kick off the new gaming seaosn : Mass effect 2; Alien VS predator, etc..) if you could have a look at the winter olympic games! would be interested to have your thought on it!! Glad to hear you're on the mend, Mitch.